Ruth had her first checkup last week with the Neurosurgeon since nicu discharge. I was very nervous about this visit, since she doesn't currently have a vp shunt (a device that drains excess fluid from the brain to the abdominal cavity, where it is absorbed). One of the reasons we initially found Ruth's spina bifida on ultrasound was because she has hydrocephilus, which is "water on the brain". Most kids with spina bifida have this, and most end up needing a shunt to control it. Fetal surgery has shown to reduce that by about half, and so far she is in the half that doesn't have one. 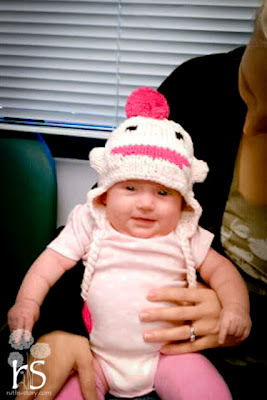 So, needless to say I was worried we would go to this appointment and hear the words "your baby needs brain surgery". The main symptoms are a bulging soft spot, rapidly increasing head circumference, vomiting, sunseting eyes, and severe discomfort. Ruth doesn't really have any of those, other than her head jumped in size from 2 months to 4 months, but since the rest of her did also, that isn't overly concerning. We met with one of the fellows first, and she took her history and made copies of all her records from SF. Then the neurosurgeon came in. He asked us questions about how she was doing, eating problems, breathing problems, and other things that can be symptoms of a neurological issue. She has been doing great, so no concerns. Ruth had fallen asleep by then, and the doctor looked at her head and back, and said he felt she was doing fine. He wants to do a rapid MRI (no sedation) in 3 months just to check her hydrocephilus, but for now, she is good! I really liked this surgeon. Someone of that elite specialty you might expect not the greatest bedside manner, but he was really friendly, didn't rush and took the time to answer all our questions and concerns. There are many other potential complications besides hydrocephilus, and we talked about those some. He basically said he treats the symptoms, not what he sees on a scan. He is also very conservative in shunt placement, which I appreciate. Definitely don't want her to have a surgery if its not needed! We talked about the MOM study and fetal surgery. He said overall he isn't impressed with the results from the fetal surgery vs. the huge risks. Although as a surgeon, he thinks its very cool and would love to learn to do it depending on the findings of the study. We did show him the photos from the surgery (sorry, can't post those online). That seems to be a theme here, not many of her current SB docs are really crazy about the fetal surgery. A big contrast in the specialists we met before her surgery, which all thought the world of it! I'm not sure what the study will conclude, but I am so grateful we got the chance to participate. The odds are some of the damage was prevented by closing the opening to her spinal cord earlier, and that's something I feel made all of it worth it. So, overall great checkup. She is not out of the woods yet, so please continue to pray for our Ruthie. We didn't do the surgery, though we were offered it, basically because our neurosurgeon said the same thing (he was offered to do the surgeries and turned them down). It doesn't matter if you do or don't, what matters is if you made what choice you feel was/is best for your child... and you did! She is so adorable! I'm glad she is doing well and not needing a shunt!